Step up to the Nikon 1 system and start capturing all the moments that matter to you, as outstanding photos, HD videos and Motion Snapshots. Streamlined for value, the Nikon 1 S1 balances the exceptional speed and image quality of the Nikon 1 system with innovative new features for catching the best shots and inspiring your creativity. Swap lenses for exciting new views, add creative effects, simultaneously capture video and stills and so much more. 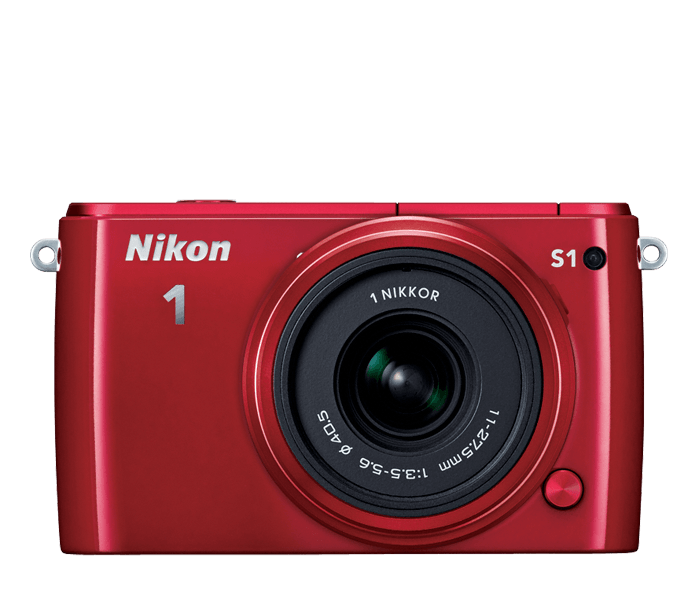 Remarkably easy to use and brilliantly designed, the Nikon 1 S1 will have you taking more—and better—photos than ever. The Nikon 1 S1 focuses and shoots faster than any camera you've ever used. While everyone else is framing their first shot, you'll already have captured a dozen great photos. Trying to catch a fast-moving subject? Fire a blazing-fast 15 shots per second and turn an instant of action into an amazing sequence of photos. And don't worry about camera shake—electronic Vibration Reduction keeps your shots steady even when your hands are not. The best moments are made and missed in an instant, so the Nikon 1 S1 gives you every advantage for catching them. Want to capture a baby's smile? Turn on Smart Photo Selector and take your shot. The Nikon 1 S1 will record 20 frames, then pick the best ones. Trying to catch your favorite little leaguer rounding second base? Turn on Slow View and see live action in slow motion, then easily freeze exactly the moment you want to remember. Your creativity isn't limited to still photos with Nikon 1 cameras. A single press of a button and you'll be recording dazzling Full HD 1080p video with stereo sound. See something that would make a great still image while you're recording? Simultaneously shoot full-resolution photos without missing a beat. Get the best of both worlds. With the Nikon 1 S1, you'll never have to wait to share your shots. Add Nikon's WU-1b Wireless Adapter (sold separately), and instantly transfer your photos, videos or Motion Snapshots to your smartphone or tablet±. Then share them as usual—by email, text message or by uploading them to your favorite photo-sharing websites. It couldn't be easier! Capture the essence of a moment with Motion Snapshot, a unique blend of motion, stills and sound that can be shared as .MOV files or arranged into a slideshow. Add artistic flare with the Nikon 1's Creative Mode—shoot in black & white, highlight a single color in an image or create expansive panoramas. Use Live Image Control to preview the effects of Background Softening, Brightness Control, Motion Control or Active D-Lighting while shooting. Spend more time creating and less time fussing with your camera. 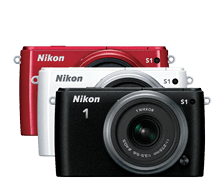 The Nikon 1 S1's high-resolution 3.0-inch 460,000-dot LCD and remarkably simple menus and buttons make it easy to change modes, adjust key settings or apply effects. In no time at all, you'll be shooting with confidence.